Your pet’s safety while with us undergoing surgical or medical procedures is very important to us. Your pet is family and we treat them accordingly. We monitor your pet with state of the art monitoring while undergoing anesthesia to avoid any complications. 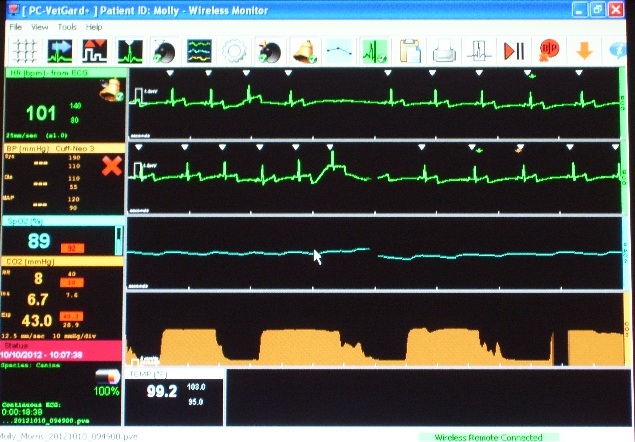 PC Vet monitoring is utilized to protect your pet: http://www.vmedtechnology.com/PC-VetGardplus.htm . Our veterinarians and technicians are highly trained and skilled in monitoring anesthesia and vital signs, to provide the easiest induction and recovery for your pet. We use the most up to date safe anesthetic protocols. Anesthetic agents vary depending on the type of anesthesia needed for the procedure. See our anesthesia descriptions and contact us with any questions you have about the procedures.